So, who are we meeting up with today? 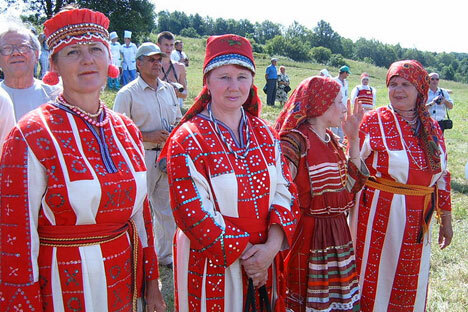 The Mordva – a people populating the Volga river area. Now, I am really in for it if some linguists-ethnographers are hearing this!.. The fact is, for many decades now there has been a heated debate regarding this very name. Some insist the Mordva are a single people… Others say: nothing of the kind! There are ethnos such as mokshane, erziya, and several more sub-ethnos. True, they do have a great deal in common…true… And they will proceed to name a great many of these ‘true’ – there is the republic Mordovia itself, in the heart of the European part of Russia, and almost a million Mordovians… Then, if we dig deeper into antiquity, we can recall the words of Herodotus, who said: “This dignified country inhabited by the Mordva people”, why shouldn’t we follow his example?